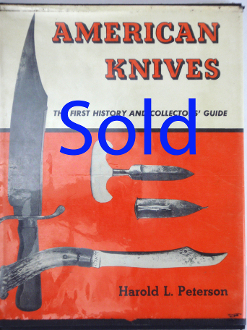 Book Details: Reference in book is of knife names, knives of the explorers and colonist, the bowie and its associates, army knives, naval dirks and other knives, the Indian and his knife, pocket knives, the manufacture and sharpening of knives and more. Book shows some wear, mostly handling marks on the dust cover, book itself looks acceptable with some scuff marks and some edge dents. Hard cover 6 1/4” x 9 1/2”.